Registering for NMYBBSB is done via this website, but there are often some in-person registration sessions each season. If you cannot register online and don’t know when an in-person session is scheduled, you can contact either the NMYBBSB or the . If you have questions or concerns about cost or payments, you can contact the . After registration has closed, the league commissioners will establish teams and scheduled and you will be notified of team and coach assignment. Depending on when you registered, it might be a short wait before you hear back from the league. After registering you may get notification of an assessment session that will be used to help establish fair teams. Commissioners or the vice president will be glad to answer all questions about the different divisions before, during or after a season. Division rules do change, so asking questions is encouraged. Players do not have to start at the youngest divisions to be able to play baseball or softball. It’s almost never too late to try baseball or softball. If you have any concerns or questions, contact the division commissioner. New Milford baseball and softball spring seasons typical starts with practices in April as soon as the fields are ready for play and weather allows. Games will usually start at the end of April. Seasons conclude in early June. New Milford baseball and softball fall seasons start in early September and usually conclude in late October. Occasionally games postponed due to weather will finish in early November. If a player is interested in travel baseball or softball, the can assist in learning more about that part of the NMYBBSB program. Travel teams most often require tryouts and some tryouts are conducted in fall for upcoming summer teams. There is a variety of gear available for baseball and softball at a wide range of price points. When starting out in T-ball, it is best to purchase T-ball specific gear. Hybrid gloves (not 100% leather) are lighter and easier for young hands to open and close. 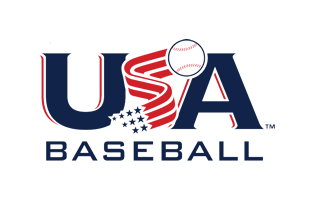 If your athlete plays baseball make sure they have a USA Baseball certified bat. Only bats with the USABat symbol on the handle are allowed for practice and games. Other gear required includes a helmet and cleats. For boys, a protective cup and baseball specific pants are required for all but the youngest ages. Softball players will need a batting helmet with face protection as well as masks when playing first, third or pitcher. The league provides coaches with catcher’s gear for each team. It is highly advised that all gear has the player’s name on it.